What Elements Are in Ink? Ink is a liquid or semi-liquid used to transfer text or an image to a surface. It consists of a colorant suspended in a liquid, either water or a solvent. A colorant is a pigment or dye. Most pigments are both water- and oil-soluble. Dyes are generally water-soluble. Some uses of inks require the addition of wax, lubricants, resins, surfactants and florescence. These added ingredients affect the flow, thickness, appearance and drying time of the ink. The earliest inks were made about 5,000 years ago. The ancient Egyptians used a mixture of charcoal and glue. At roughly the same time, the Chinese mixed soot from lamps with animal-derived gelatin to make ink. Subsequent inks were made from fruit and vegetable juices; secretions from squid, cuttlefish and octopus; and the tannin from nuts, bark and trees. Ink was even made from crushed insects. Early writing inks were made from soot and gum arabic. 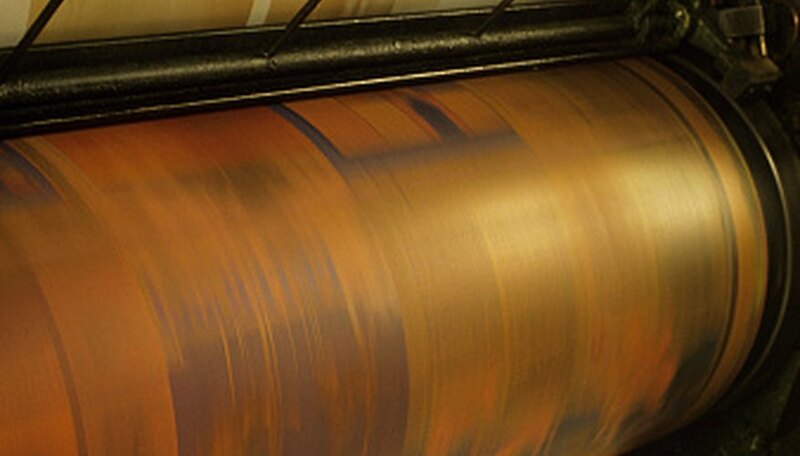 Printing inks use solvents made from petroleum, linseed oil, soybean oil and mineral oil. The colorants are primarily pigments derived from extraordinarily fine-grained powder of organic material. These pigments are used to produce inks in colors such as yellow lake, peacock blue and certain shades of green and orange. Sometimes material such as clay is added as a filler or extender because it is cheaper than adding more pigment. Inorganic pigments are used to create a wide range of colors, such as chrome green (chromium oxide), Prussian blue (ferric ferrocyanide), cadmium yellow and molybdate orange (a mix of lead chromate, molybdate and sulfate). Basic elements can produce a rainbow of colors. Carbon is used to create ivory black and lamp black. Zinc is used in the production of zinc white. White can also be made from titanium and lead. Cobalt will yield cobalt blue and cerulean blue. Copper is used to make pigments of blue, green and purple. Cadmium yellow, cadmium red, cadmium green and cadmium orange are derived from, of course, cadmium. Iron oxides are responsible for Earth tone pigments, such as yellow ochre, raw sienna, burnt sienna, raw umber and burnt umber. The ink for ballpoint pens, felt-tip markers and fiber-tip pens contains water or organic solvents such as propylene glycol, alcohol and toluene. The paste-like ink is smooth flowing, non-smearing and quick-drying. Ballpoint pen ink is about 40 percent oil-based dye. Pigment is not used because it clogs the pen’s tip. Fountain pens use water-based ink. Don Young started writing in 1992, with a special interest in biography. He has published more than two dozen nonfiction books through Houghton Mifflin and Holtzbrink. Young holds a Bachelor of Arts in history from a New York state private college.